This story originally ran Oct. 12, 2018 and describes, in detail, the GIS mapping tools integrated by the city of Bridgeport and developed by Tim Bumgardner of the city's engineering and IT departments. The city has now developed a GIS portal where all mapping tools can be accessed and utilized. The city hopes current and prospective residents and business owners will take advantage of these tools. Find the Bridgeport GIS Mapping Portal HERE and read more about the tools in the story below. The City of Bridgeport has some high-tech tools on its Web site, enabling residents and business owners to learn important information about zoning, land use and business incentive programs, and to answer inquiries with regard to floodplain locations. Those interactive GIS (geographic information system) maps were all designed by Tim Bumgardner of the City’s engineering/IT departments. The newest map is an Election Polling Location Map for city elections. By accessing the map, residents can find out their polling place, the issue and date of the next election, hours of polling place and other information. The next city election is Feb. 16 and is for a levy vote. To participate in this election, voters must be registered by Oct. 16. The map was inspired, Bumgardner said, because the City Clerk’s office receives so many phone calls from residents who are unsure about where they are supposed to cast votes during elections. “Now people can go into that map, type their address or have the option of finding their house on the map and basically it will show you where to go vote, based on voting precincts,” he said. Not every single address will produce results, but streets will, as will the option of indicating resident location on the map. Contact information for City Clerk Shelby Watkins is also included for folks who have further questions. 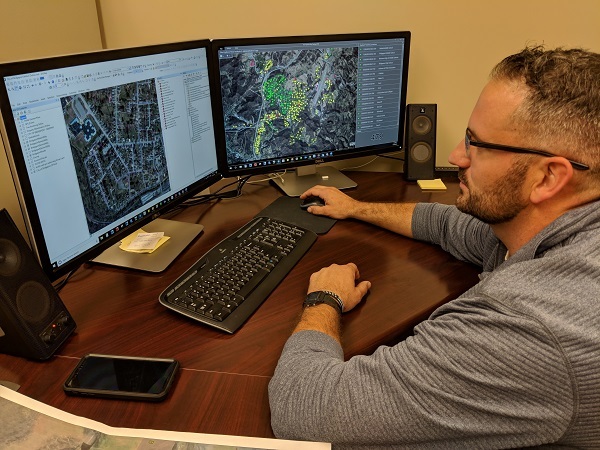 Bumgardner, who has been with the city for 13 years - starting out at the cemetery, then working with Bridgeport Public Works before joining the engineering department - now serves as GIS Technician/Floodplain Manager. “With our GIS now online, I’ve been diving into ways to get information out to the public,” he said. For instance, the city's Zoning Map used to be available in paper format via download from the City’s Web site. “Now, businesses looking at coming to the city and want to know what the stipulations are can click on an address and get information on zoning. There are also links that can actually take you to zoning regulations, so you can look up the city’s codes,” Bumbardner said. The Incentive Map covers business incentives offered by the City of Bridgeport. Since business incentives are offered in certain locations, the map indicates those areas. Based on FEMA’s mapping, the city’s Flood Plain Map can be accessed to ascertain if a residence or other structure is located in a flood plain. The aerial photography on the maps was contracted out through Blue Mountain, the company that did the city’s first aerial photographs. The technology all combines to provide residents with interactive tools at their fingertips, but they are only useful if residents know they are there and how to use them, Bumgardner said.